The EF-S 18-135mm f/3.5-5.6 IS USM Lens is attractive on many fronts, including its wide (7.5x) focal length range, its relatively small size and light weight, its fast, smooth and accurate autofocusing, its great functionality including image stabilization and its modest price. This is Canon's third iteration of the EF-S 18-135mm image stabilized lens. The first model featured a cost-effective DC motor. The second generation received a stepping motor, producing smooth and very quiet focus acquisition and tracking that was ideal for Movie Servo AF. The latest lens receives Ring USM-driven AF. Seeing "USM" (Ultrasonic Motor) in the lens name seems very common for those of us using Canon lenses and we usually count on very fast focusing driven by a Ring-USM variant. But, this Ring USM is like no other we've seen before. The EF-S 18-135mm USM has Canon's first Nano-USM AF motor implementation, promising us the silence and smoothness of STM with considerably faster AF drive. Read on to learn more about this feature. Narrowing down the focal length or focal length range ideal for your photographic needs is the first criterion for lens selection. The focal length chosen for a particular image determines the distance required for proper framing and in turn, the perspective. There are times when the ideal subject distance cannot be obtained, perhaps due to an obstacle (such as a wall), and in those cases, having a zoom range to work with permits ideal subject framing from the subject distance available to you. The focal length range of this lens is a hugely valuable asset. 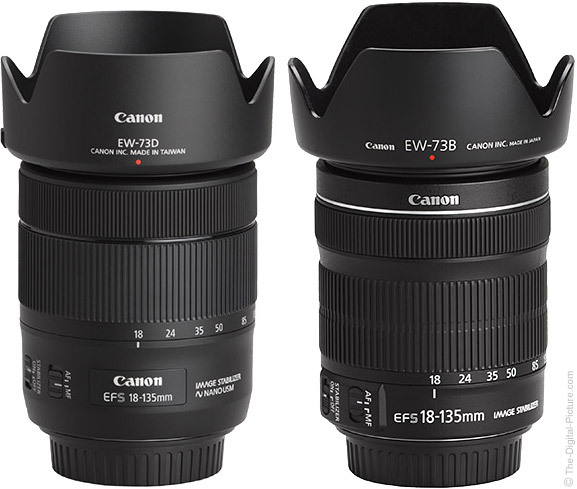 As an "EF-S" lens, the 18-135 IS USM is only compatible with Canon APS-C format cameras. permitting APS-C-only "EF-S" lenses to be smaller, lighter and less expensive relative to their full frame lens counterparts (which remain compatible with the APS-C cameras). With a smaller imaging sensor than full frame models, APS-C format cameras do not require the larger image circle projected by full frame compatible lenses, permitting APS-C-only "EF-S" lenses to be smaller, lighter and less expensive to manufacture relative to their full frame lens counterparts (which remain compatible with the APS-C cameras). Using a smaller image circle means that APS-C sensor format cameras frame a scene more tightly, with 1.6x being the multiplier (FOVCF) used to determine the full frame angle of view equivalent. Multiplying 18-135mm by 1.6x yields 28.8-216mm, the full frame 35mm format camera angle of view equivalent for this lens. The list of uses for these focal lengths is as long as the focal length range itself. Even if I had the time to create a comprehensive list of uses for this wide general purpose focal length range, you would not likely have the time or interest to read it. But, I'll get you started with some ideas. For sure is that this is an excellent travel lens. When traveling, especially when not driving yourself to the location, your luggage size and weight is likely limited. Fewer lenses with smaller size and weights make conforming to these requirements easier. Also, traveling frequently involves spending lots of time with a camera in hand. The same reasons make this use less tiring and more pleasant. A superb set of portrait focal lengths are built into this lens, including the much-acclaimed 85-135mm (full frame angle of view equivalent) range. The ideal focal lengths are provided for full body portraits (29mm was used for the above image) through tight head shots. Preserving family memories can be fully accommodated by these focal lengths. While I prefer a lens that zooms out to a 24mm angle of view equivalent (15mm) if landscape photography is on my to-do list, the 29mm equivalent angle of view (at 18mm) will take in moderately wide views of nature. And, the rest of the focal lengths included in this lens are all very useful for landscape photography. The video uses for this focal length range are similar as for still photos. 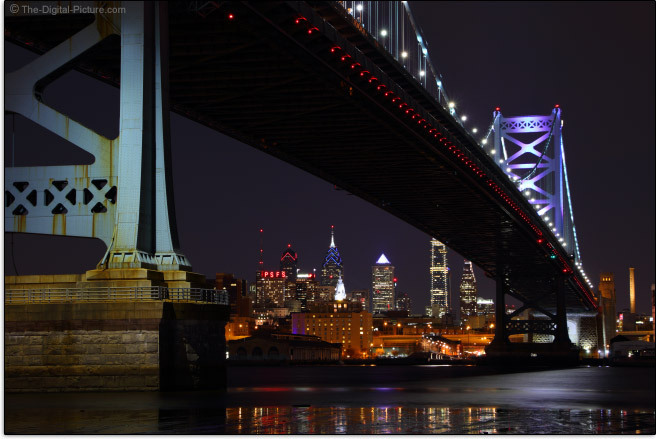 For an example of what this focal length range looks like, we head below the Ben Franklin Bridge in New Jersey and view the Philadelphia skyline below it. If you are considering a lens with 50mm or similar at the long end, specifically compare the 50mm focal length to 135mm. The difference is dramatic – the extra length is really nice to have without a lens change required. The f/3.5-5.6 in the lens name refers to the lens' max aperture opening, the relationship of the lens opening (diaphragm) to focal length. The lower the number, the more light the lens will allow to reach the sensor. Each "stop" in aperture change (examples: f/2.8, f/4.0, f/5.6, f/8, f/11) increases or reduces the amount of light reaching the sensor by a factor of 2x (a big deal). Because aperture is measured as a ratio of lens opening to focal length and because this lens has a (basically) constant maximum opening, this lens has a variable max aperture. As the focal length increases, the maximum opening size does not appreciably increase, resulting in aperture measurements stepping down. Here is a chart showing the specific focal lengths where this happens along with the same information for a selection of other lenses. 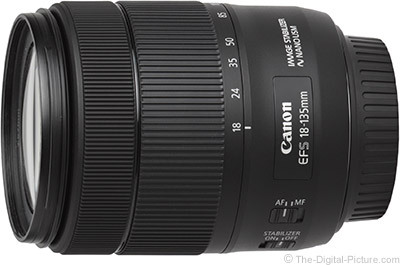 If your lens is missing from this list, head over to the full Canon EF-S 18-135mm f/3.5-5.6 IS USM Lens specifications with the site's Lens Spec tool enabling far more comparisons. While the step-downs occur in 1/3 stop increments, somewhat unusual is the f/5 aperture remains selected when the aperture is changed by one click at 50mm. Canon's software calls the actual aperture f/5.0 for both clicks, but Adobe Bridge indicates that the "Max Aperture Value" (max available) is f/4.8. This is only a very minor concern, but I encountered it frequently when testing at 50mm. Allowing more light to reach the sensor permits freezing action and handholding the camera in lower light levels and can also permit use of lower (less noisy) ISO settings. In addition to allowing more light to reach the sensor, increasing the opening permits a stronger, subject-isolating background blur (at equivalent focal lengths). Lenses with an opening to at least a specific aperture (usually f/2.8) enable the higher precision AF capabilities (most often the center AF point) in some cameras and present a brighter viewfinder image. 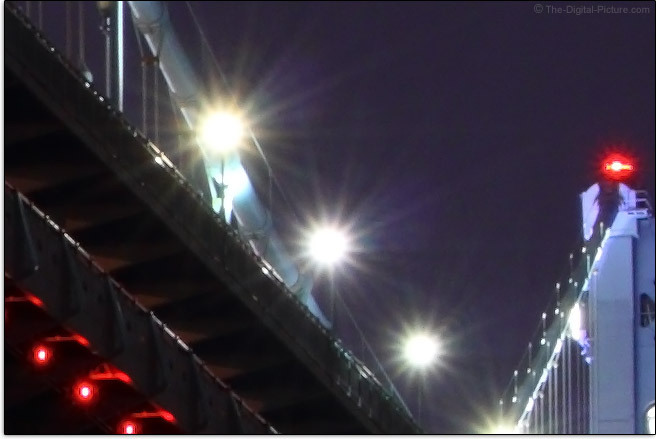 Another benefit, especially when shooting in Manual exposure mode, is that constant max aperture lenses permit that max aperture to be set and remain constant regardless of the focal length selected. The advantages to a narrow aperture, because the size of the lens elements can be reduced significantly in size, include smaller size, lighter weight and lower cost. Those are three things that we all can appreciate. Relative to the max aperture available in other lenses, the Canon EF-S 18-135mm f/3.5-5.6 IS USM Lens is relatively "slow", with few other lenses having narrower max apertures. However, many are near-equivalents and this max aperture range is not unusual, especially for non-professional lenses. Still, this would not be my first choice lens for indoor sports and similar. While this lens does not have the widest apertures available, image stabilization aids in handholding the camera in lower light levels and enables lower ISO settings to be used. When IS is in use, longer handheld exposures can be used without camera motion blur showing in the image. Stabilizing the image does nothing to slow a subject in motion, so IS does not aid in freezing subject movement in a picture. When the shutter is half-pressed, Live View is started or Video Mode is entered, the EF-S 18-135 USM's IS system goes into action. Fortunately, the only hint to IS being active is the image becoming very noticeably more still, making ideal subject framing easier. This is one of the quietest IS systems available. It is practically silent with only very light clicking and humming heard with an ear immediately next to lens. Unlike some stabilization implementations, the image does not bounce in the viewfinder even on startup and shutdown, and the image remains stable even with the camera being moved around (important for video recording). If the camera is held very still (nearly tripod-steady such as when braced against something stationary), some framing drift can be seen. That is reason alone to turn IS off when shooting from a tripod. Canon rates this IS implementation for 4 stops of assistance, meaning the lens can be handheld in 16x lower light levels than without IS. Your results will vary greatly depending on a variety of factors affecting your ability to hold the camera steady during the exposure, including wind, footing stability, state of relaxation, skill, etc. Also, your tolerance for keeper rate percentage comes into play. If you don't mind taking 20 photos to insure that one sharp image is captured, you can use this lens under lower light levels than someone who requires every frame to be sharp. Under controlled (favorable) test conditions, I could handhold the EF-S 18-135 USM lens at 18mm with a high keeper percentage at 1/4 second shutter speeds, representing about 3 stops of assistance for me. At 1/4 second I hit a wall on this day, with a very low keeper rate at longer exposures. At 135mm, I had a near perfect set at 1/15 of a second, representing just under 4 stops of assistance for me. At this focal length, the keeper rate slowly declined as exposure times increased with sharp images captured even at 1/5 second. I find image stabilization to be a great feature on any lens, but I find it especially useful on a narrow aperture lens such as this one. Due to low inertia, light lenses can sometimes be harder to hold steady than heavier ones, making IS even more important on this lens. The 18-135 USM's image stabilization system provides a very steady viewfinder image and definitely increases my keeper rate. 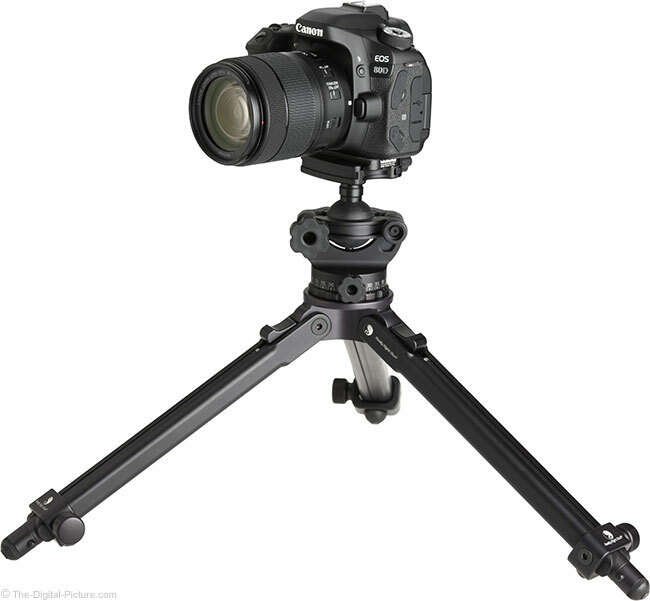 I should note that a tripod can provide the same benefit, though with added inconvenience and reduced flexibility. Impatient subjects may not appreciate the tripod option. Image quality is always a top consideration for lens selection as a lens is usually the minimum factor for image quality in current DSLR cameras. With the image-softening effects of diffraction beginning to show at apertures as wide as f/5.9 on the review-time latest APS-C DSLRs (24 megapixel models), and becoming increasingly apparent as the aperture is stopped down, a "slow" lens' performance at its widest apertures becomes more paramount. Lenses usually perform best at 1 or 2 stops narrower than their max apertures, but ... we don't have much headroom with this (and other) slow lenses. While overall lens image quality, especially from a zoom lens, is very complicated, "sharpness", referring to contrast and resolution, is often the primary attribute photographers are interested in. This attribute potentially changes, minimally, with focal length, aperture and position in the image circle. What didn't change is this lens' optical design from the 18-135 STM predecessor. With the light bending the least in the center of the image circle (center of the frame), this is where most lenses are at their best. At 18mm, the Canon EF-S 18-135mm f/3.5-5.6 IS USM Lens has good sharpness in the center of the frame and loses little until the extreme corners. Extreme corners are moderately soft and improve as the aperture is stopped down, though they never become totally sharp. Aside from the corners, stopping down makes little difference in sharpness. Wide open image quality deteriorates somewhat through 35mm and 50mm, improves at 85mm and slightly declines again at 135mm, mostly noticeable mid-frame and in the corners. Extreme corners again trail the center of the frame. Following are some real world images captured with a Canon EOS 80D DSLR camera. These are 100% resolution crops taken from images captured in RAW format and processed in DPP using the Standard Picture Style with sharpness set to "1" (very low). The following examples are from the center of the frame. In the center of the frame, little difference in sharpness is achieved by stopping down. Stopping down 1/3 stop at 50mm is the biggest change in the above comparisons. The following samples show the extreme top-left corner for 18mm and 50mm. The 135mm samples are from the bottom right. in a properly adjusted lens, image quality in all four corners should be the same and this lens ig good in this regard. These just happen to be the corners I selected for illustration. At 18mm, we see major improvements as the aperture is narrowed. 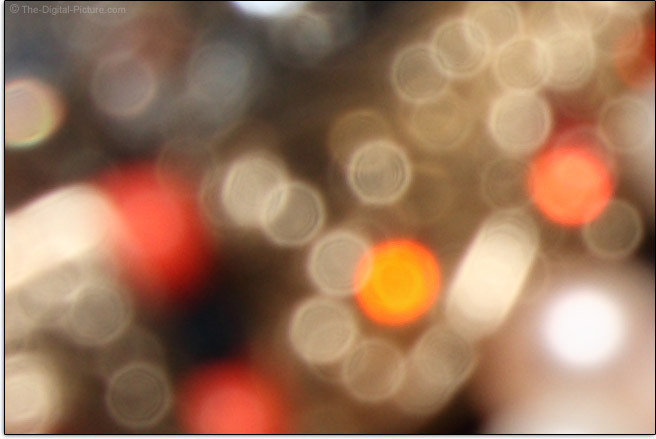 Notably absent in the 50mm corner crops is chromatic aberration – more about this soon. Again, these are extreme corner examples. Image quality is notably better deeper into the image circle. Note that I omitted f/11 and narrower aperture examples from the above comparisons because they were not as sharp as the f/8 examples due to the effects of diffraction. While it is not completely fair to compare a relatively low cost lens to a high end pro-grade prime lens, it is helpful to understand the image quality difference. To see what I'm referring to, compare the EF-S 18-135mm USM lens to the EF 200mm f/2L IS. These two lenses are not anywhere close to each other in most regards including size, weight, price, etc., but again, it is helpful to see ideal image quality as a reference for what a lesser lens is delivering from the same camera. Vignetting (peripheral shading) is rather well-controlled in this lens, at least well-controlled relative to other lenses used at their wide open apertures. Expect a modestly visible amount of corner shading, between 1 to 1.5 stops, at wide open apertures. By f/8, vignetting is essentially gone. The clearing of peripheral shading can be seen in the corner crops shown above. Also noticeable in the corner crops is lateral (or transverse) CA (Chromatic Aberration), the most easily recognized type of CA. Lateral CA shows as various wavelengths of light being magnified differently with the effect being increasingly noticeable toward the image circle periphery, causing the most-effected area of the image to appear less sharp due to misaligned colors. Look for the strongest color fringing along edges of strongly contrasting lines running tangential (meridional, right angles to radii) near the corners of the frame, generally irrespective of the aperture used. Zoom lenses, especially affordable ones, often have LatCA and LatCA is generally worst at one or both ends of the focal length range. 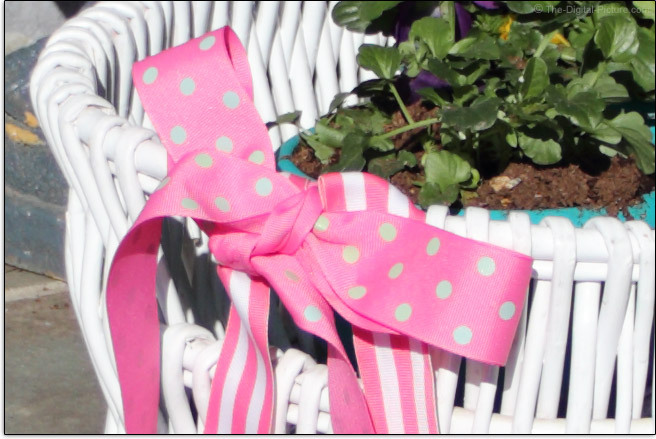 Following are three 100% crop examples taken from the top right corner of Canon EOS 80D images. The color misalignment is especially strong at 18mm and noticeable at 135mm. 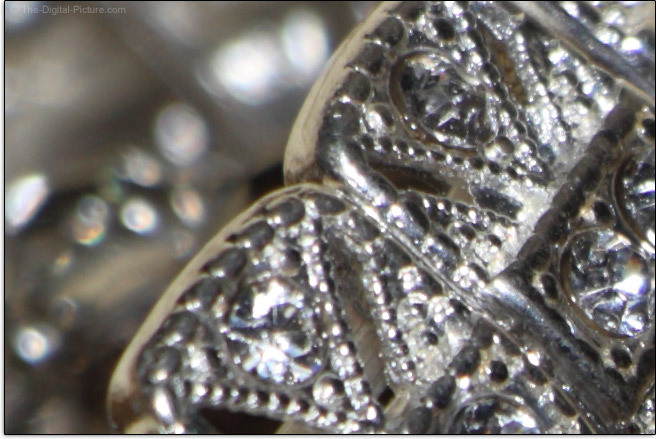 The 50mm example shows how that LatCA is better-controlled in the mid focal length range. 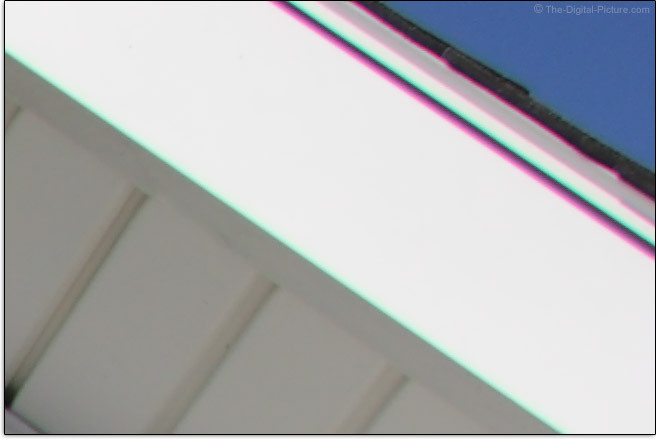 Fortunately, lateral CA is easily software corrected (often in the camera) by radially shifting the colors to coincide. 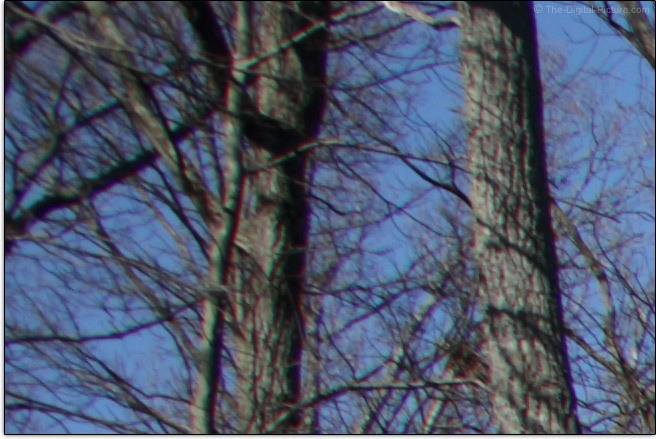 Axial CA and spherical aberration are not impacting issues for this lens. Strong color fringing is not seen at or near the point of focus in this subject that readily highlights these aberrations. While not flare free, the 18-135 USM controls flare reasonably well. As usual, the effects of flare become more obvious when narrower apertures are used. This lens has a noticeable amount of barrel distortion at the wide end, causing subjects in the center of the frame to appear slightly enlarged relative to subject matter in the sides and corners of the frame. Much of the time this distortion will not be noticed, but if a straight line is running along the margins of the frame, the curvature will be very apparent as shown in the 18mm example shown below. This image is showing the full width of the bottom of an 18mm frame. To keep lines straight, zoom in to roughly 24mm where linear distortion is imperceptible. Zooming in further results in a transition to mild-to-moderate pincushion distortion throughout the balance of the focal length range. These results are not unusual and can vary with aperture, focus distance, subject distance and other factors. With an aperture blade count of 7, distant point light sources showing a star-like effect will have 14 points due to the odd vs. even number blade count. The points on these stars are coming from the blades of the aperture. Each blade is responsible, via diffraction, for creating two points of the star effect. If the blades are arranged opposite of each other (an even blade count), the points on the stars will equal the blade count as two blades share in creating a single pair of points. The blades of an odd blade count aperture are not opposing and the result is that each blade creates its own two points. Seven blades times two points each mean 14-point star effects. That said, creating stars from specular highlights is not a strength of this lens. 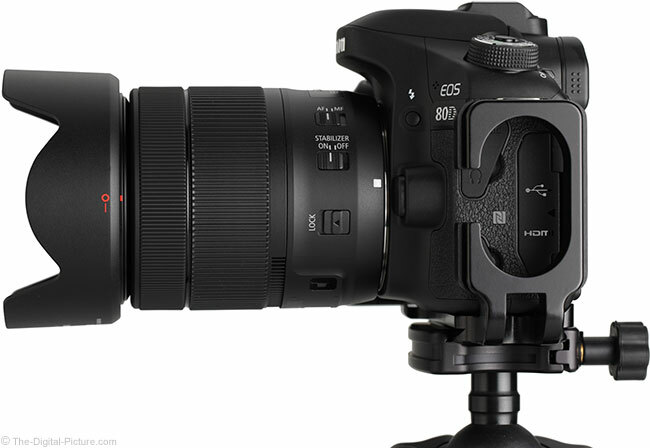 Here is a comparison with the Canon EF 24-70mm f/2.8L II USM Lens (top-of-the-line, pro-grade lens). While this is not a completely apples-to-apples comparison, it closely approximates the real differences in results. The 18-135 creates some modest stars, but the 24-70 goes star crazy. The first EF-S 18-135mm IS lens utilized a DC micro motor for AF drive, the then-current choice for economical lenses. 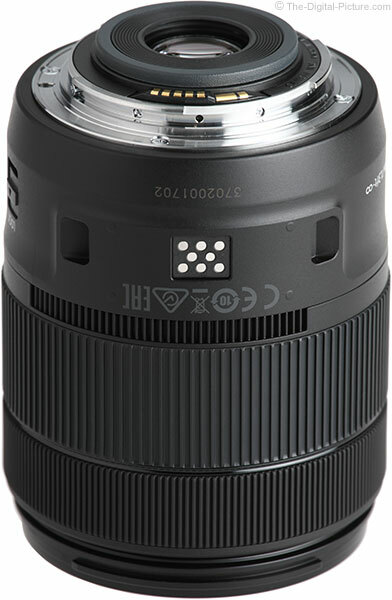 This feature was directly targeted for upgrade by the second version of this lens, the EF-S 18-135mm IS STM. The STM (Stepping Motor) AF system provided very good, though not really fast, autofocusing performance with other benefits included. Two of the biggest benefits of the STM system were smoothness and quietness, both features that were highly desired for video recording. While Ring USM remained Canon's preference for the review-time-latest high end lens designs, these lenses did not generally focus so smoothly in Movie Servo AF. 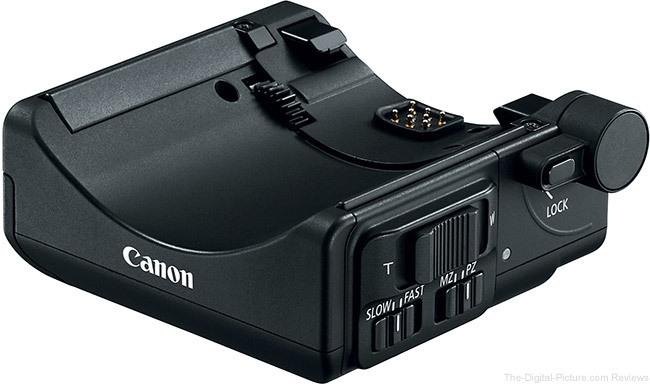 While the review-time-latest Canon DSLRs are able to focus a Ring USM lens with decent smoothness, these lenses still do not focus as smoothly as the STM lenses and there is considerably more focus chatter sound during Movie Servo AF. Nano USM acts like heavily-caffeinated STM AF, combining the benefits of a high speed Ring USM actuator with the stepping motor's quiet and smooth, direct, lead screw-type drive system. Like Ring USM driven AF systems, Nano USM focuses extremely fast. Like STM AF systems, Nano USM focuses almost silently, with only faint sounds heard with one's ear next to the lens. And, it focuses very smoothly. Canon U.S.A.'s Rudy Winston states: "Canon’s new Nano USM technology uses a completely different form factor, but achieves focus results within the lens via the same principles of ultrasonic vibration energy, transmitted here into linear (rather than rotational) movement within the lens. This tiny new Ultrasonic motor achieves the combination of fast, near-instant response during still image shooting, with the smoothness required for good focus during video recording." While the 18-135 STM was not a slow-focusing lens, the 18-135 USM drives the focusing lens up to 4.3x faster at the telephoto end and 2.5x faster at wide angle end. [per Canon] I didn't feel the need to scientifically verify these figures, but mounting both lenses on cameras and switching back and forth between the two makes the focus speed difference quite noticeable. Accuracy from the Canon EF-S 18-135mm f/3.5-5.6 IS USM Lens has been excellent, both in One Shot and AI Servo modes. I can reliably count on this lens getting the focus distance right (when I do my part properly of course). The AF performance from the first Nano USM lens predicts more Nano USM lenses coming. Like STM, Nano USM utilizes a focus-by-wire or electrical manual focus design (vs. a direct gear-driven system). The manual focus ring electronically controls the focus of the lens. 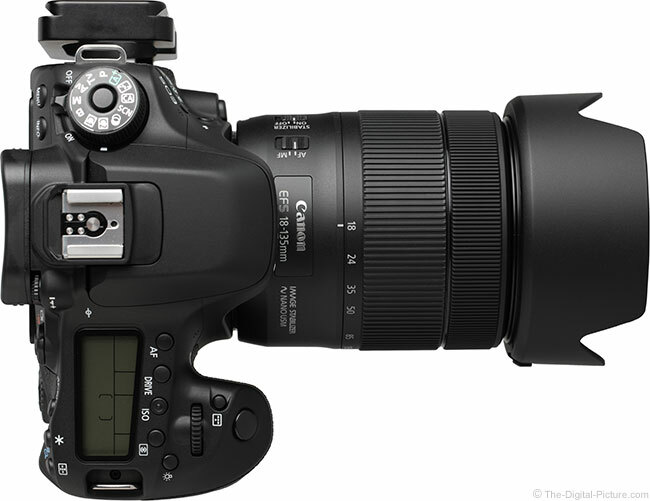 FTM (Full Time Manual) focusing is supported in AF mode with the camera in One Shot Drive Mode, but the shutter release must be half-pressed for the focus ring to become active. Note that FTM does not work if electronic manual focusing is disabled in the camera's menu (if this option is present). The lens' switch must be in the "MF" position and the camera meter must be on/awake for conventional manual focusing to be available. The 18-135 USM lens' focus ring is very nicely-sized, ideally positioned (forward of the zoom ring) and is smooth with no play. With electronics driving AF, the rate of focus change caused by the focus ring can be variable, based on rotation speed, and that is the case with the 18-135 USM. While we list 245° of focus ring rotation in the specs, a fast ring turn will induce a much faster focus distance change than a slow turn. It seems like the focus distance barely changes when the ring is turned slowly, making prescise focus easy – as long as the rate of turn remains constant. While I see the advantages of the multi-speed AF ring, I found obtaining perfect focus distance using my normal practice of rocking the focus ring back and forth to be somewhat frustrating. Using marked focus ring pulls with lens this requires a skillful rate of turn, both in setup and execution of the pull. I would likely get used to this system and was quite successful in using it, but ... the focus ring seems to have a mind of its own sometimes. The first STM lenses went through an initialization process during power-up that involves the lens racking focus by some amount in both directions. This process caused me concern when I had carefully setup a shot, waited for the right timing, woke up the camera and watched my scene go temporarily out of focus. I determined that the focus was returning to my previously set distance and no longer stressed at the initialization process, but ... better is that this lens does not have that attribute. The 18-135 USM's manual focus setting is not adjusted when the camera is awakened. Manual focus adjustments are smooth and centered with no unusual framing shift happening – alignment remains tight. With the camera powered off, this lens is dramatically far from being parfocal - the scene goes from in sharp focus to very strongly blurred by changing focal length. Power the camera on and the lens makes an attempt to be parfocal, but my review lens was still not completely parfocal. Movie Servo and AI Servo AF modes will compensate for this change automatically, but otherwise, focus should be re-obtained after a focal length change. No focus distance window or markings are provided, making at-a-glance focus distance checks not possible. This is a rear-focusing AF system. The lens does not extend with focusing and the front filter threads do not rotate. Expect some minor subject size change in the frame when pulling focus using this lens. Cameras featuring Hybrid or Dual Pixel CMOS AF and Movie Servo AF make video recording very easy and the STM lenses are very well-suited for this task. The smooth focusing makes focus distance transitions easy on the viewer's eyes and the sound of the lens focusing is not picked up by the camera's mic. Even the STM lens' aperture changes are quiet and smooth. This Nano USM AF implementation capitalizes on those strengths. The Canon EF-S 18-135mm f/3.5-5.6 IS USM Lens' MFD (Minimum Focus Distance) and the related MM (Maximum Magnification) remain unchanged from the STM predecessor. That is not a problem as the 0.28x MM is an excellent spec among zoom lenses. 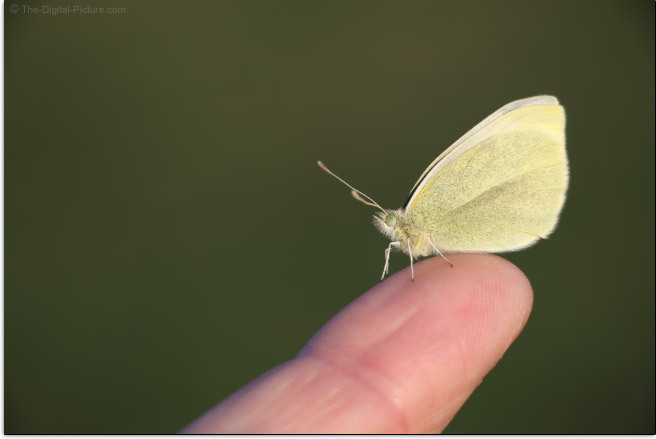 One of the first butterflies to arrive this spring, measuring about 1" (25mm) at its widest, is shown below in an uncropped image. This image was captured at 135mm at the MFD for this lens, showing also the MM. Take notice of the strongly blurred background. The 135mm focal length combined with the wide open f/5.6 aperture and MFD represents this lens' ability to blur the background. Maximum magnification specs increase and minimum focus distances decrease, as usual, with extension tubes in use. The 18-135 USM's magnification range numbers with the Canon EF 12mm Extension Tube II in place are 0.43-0.09x and 0.61-0.21x with the Canon EF 25mm Extension Tube II in place. Note that this lens may not be usable with extension tubes of combinations at the wider angle settings. This lens is not compatible with Canon Extenders. The 18-135 STM was a nicely built, nice-to-use lens and the 18-135 USM has received a bit of a makeover. Here are the two shown side-by-side. The USM version takes on a modernized appearance and loses the silver ring. 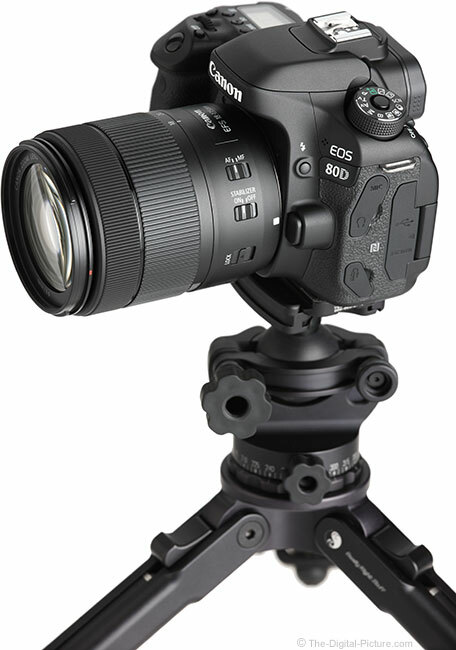 Aided by a completely flush-mount switch bank, the 18-135mm USM maintains a very even profile over much of the lens barrel, making it comfortable to hold and easy to use. 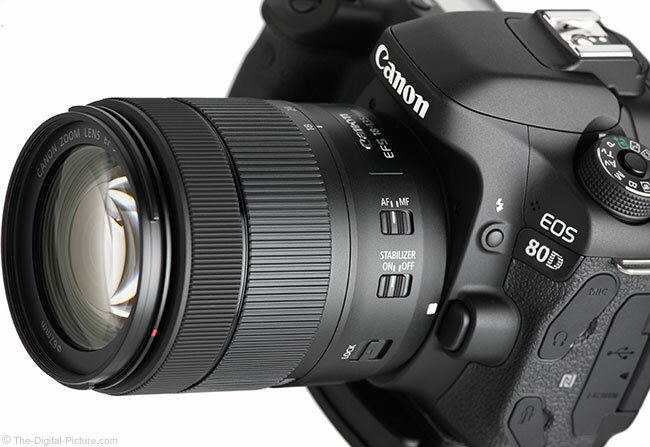 This lens features a simple exterior that is primarily zoom and focus rings. The zoom ring has been shifted forward in position and reduced slightly in size to 1.28" from 1.62" (32.5mm vs. 41.2mm). The manual focus ring has been increased in size slightly from 0.5" to 0.79" (12mm to 20mm) and has also been moved forward slightly. These rings are ideally positioned, have ideal sizes, are smooth functioning, have no play and have a nice rotational resistance/dampening. Like all of the other zoom lenses with a similar focal length range, the 18-135 USM extends with focal length increase (up to 1.95"/49.5mm). There is no play in the inner/extending lens barrel even at full extension. A lock switch is provided to retain the lens in fully retracted position (only), preventing gravity zooming. This was not an issue on the review lens, but the switch is there if auto extension ever becomes present. Normal for EF-S lenses is a quality plastic barrel and the 18-135 USM also has this. The finish is attractive and the usual ribbed-rubber-covered rings give the lens a quality feel. While this is a nicely built lens, it is not one of Canon's pro-grade models. Notably missing is full weather sealing, including a lens mount gasket seal. Recommended is to keep this lens dry. For many more comparisons, review the complete Canon EF-S 18-135mm f/3.5-5.6 IS USM Lens Specifications using the site's Lens Spec tool. The same lenses are shown below, extended with their hoods in place. 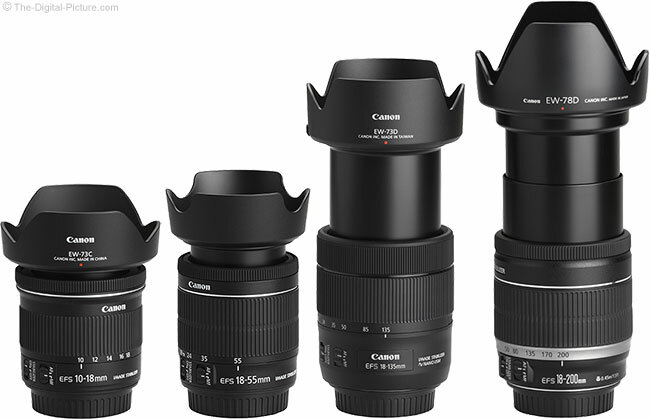 Use the site's product image comparison tool to visually compare the Canon EF-S 18-135mm IS USM Lens to other lenses. The 18-135 USM accepts 67mm threaded filters. These moderate-in-size filters are rather common for Canon lenses and not too pricey. I recommend using slim model filters such as the B+W XS-Pro line for this lens as standard thickness filters may create some mechanical vignetting at the wide end of the focal length range. The optional petal-shaped Canon EW-73D Lens Hood is relatively compact, but is large enough to provide reasonable protection for the front lens element. The lens hood protects from both impact and from bright light (especially the sun) that can reduce image contrast. As with most of Canon's recently introduced lens hoods, this one has a spring-loaded release button that allows the hood to remain locked in position yet easily installed or removed as desired. 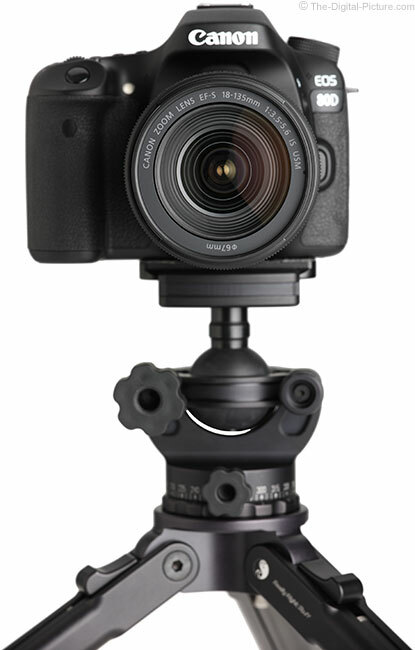 With the hood installed, expect a camera's built-in flash to be partially blocked (lens hood shadow in frame) at the wider angles (this lens does not block the built-in flash with no hood installed). While I nearly always recommend using a lens hood, the price of this matte black plastic (interior and exterior) hood seems high. Canon should have included this one in the box as the U.S.A. press release hinted. The Canon LP1116 soft drawstring lens pouch is also optional for this lens. These pouches offer only light impact protection from the side with more substantial bottom padding provided. Cases such as the Lowepro Lens Cases offer better protection for individual storage (and a lower price). 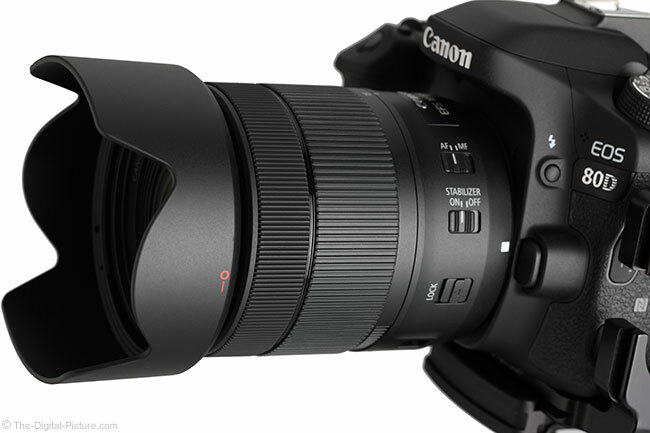 Another first that the Canon EF-S 18-135mm f/3.5-5.6 IS USM Lens delivers is compatibility with the same-time-introduced Canon Power Zoom Adapter PZ-E1. The PZ-E1 attaches to the bottom of the lens (see mount and electronic contacts above) and via a gear that interlocks with the groves in the zoom ring, providing silent electronic zoom control, including remotely from a Canon app. 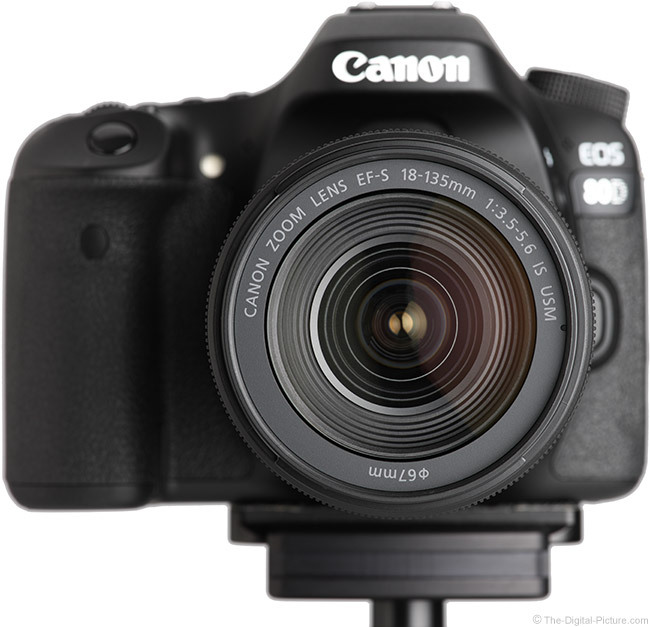 The zoom speed is adjustable, ranging from 2.4 sec up to 14 seconds for a full extents zoom change. The Canon EF-S 18-135mm f/3.5-5.6 IS USM Lens hit the streets with a price tag modestly higher than its STM predecessor's same-time-current price. The 18-135 USM is a good lens and this price makes it a decent value. Where the STM version became a really good value was in a kit with a DSLR camera (we have also posted some excellent deals for this lens). 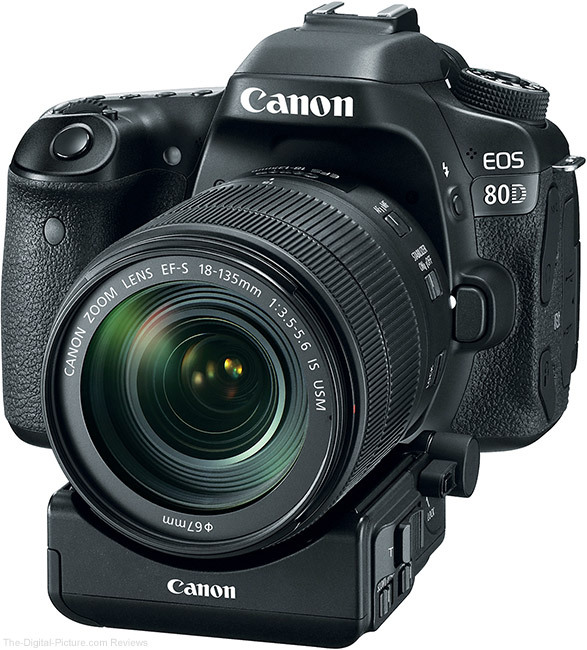 The 18-135mm USM was introduced simultaneously with the Canon EOS 80D and is available with that camera in a kit. However, there is (initially) no discount for buying the two together. Watch for that to change. Canon's standard warranty is 1 year. While this duration is among the shortest in the industry, my Canon gear seldom needs serviced. And, Canon's service and customer support is among the best available. 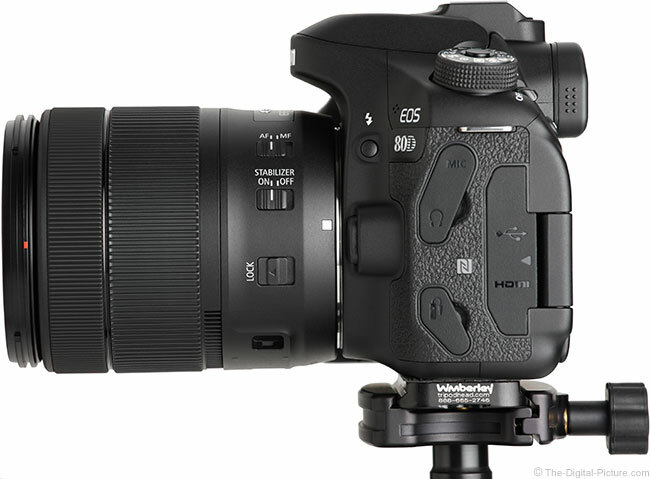 The reviewed 18-135mm USM lens was online retail sourced. With the general purpose lens being such a big one, consumers have a lot of choices. For many, the decision to buy the EF-S 18-135 IS USM will be weighed against the EF-S 18-55mm IS kit lens available at the time. 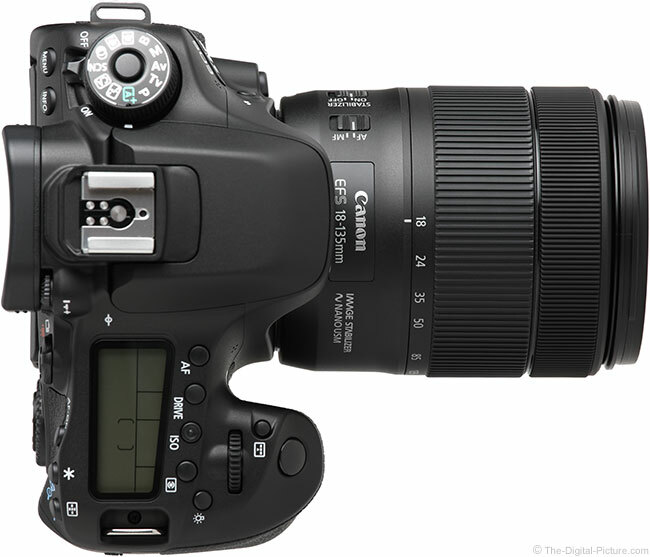 At review time, that lens is the Canon EF-S 18-55mm f/3.5-5.6 IS STM Lens. The 18-55 has the low price, small size and light weight advantage, but the 18-135 USM has a much longer focal length range and faster/better AF system. These two lenses are simiarly sharp until the long end of the 18-55's range is reached, where the 18-135 has the advantage. Though I expect the Canon EF-S 18-135mm f/3.5-5.6 IS STM Lens to be phased out of production, this lens is very similar to the 18-135 USM. Nano Ring USM is the USM version's primary advantage and modestly lower price is the STM's advantage. 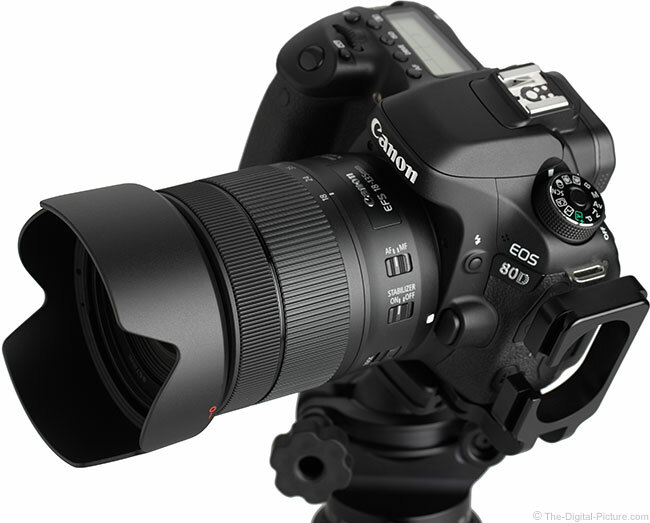 For those looking for a long focal length range, the Canon EF-S 18-200mm f/3.5-5.6 IS Lens will be another consideration. The 200mm long end of that range is very noticeably longer than 135mm. 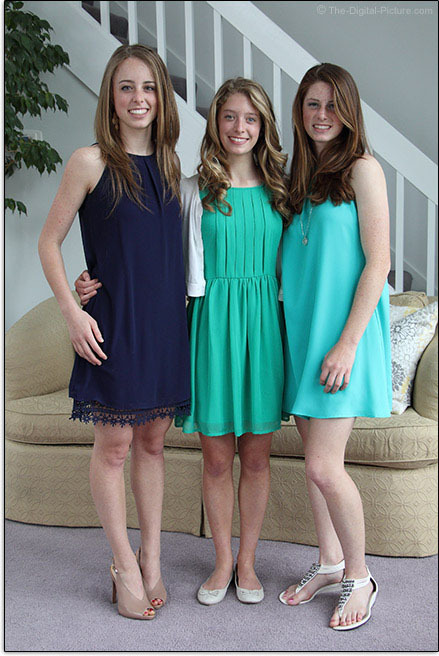 At 8 years of age, the 18-200 is starting to show signs of age. This lens was skipped over (as of review time) for the STM AF treatment and the 18-135 now has the next improved AF system, Nano Ring USM, to its strong advantage. The 18-135 is a sharper lens overall and would usually be my choice over the 18-200. While my kit is comprised of mostly pro-grade lenses, I have an 18-135mm STM lens in it and will mount that lens on occasion. That the USM version is a significant upgrade from an auto focus system perspective, it represents an even more valuable member in a kit. This is a small, light and reasonably-priced lens with effective image stabilization and a great general purpose focal length range. Combining the best aspects of USM and STM focusing technology, this lens represents an equally compelling option for both still photo and video needs.